In our current globalized and urbanized world, waste production scale is also increasing with increasing per capita consumption. The level of the impact on environment of this increasing phenomenon may vary with the variation in different factors like geographical conditions, political will, lack of community participation, level of awareness of the society and others. This waste management system has been designed and controlled by various cities across the Globe which tends to minimize the effects caused in its treatment/disposal, but a large number of these urban settlements have failed to understand the short-term and the long-term impacts of the increasing waste production. As a city grow – it undergoes various phases. The first phase may be the production of goods and materials to create employment opportunities which generally forms the basis of the city’s economy. Now the migration caused due to the increased opportunities leads to an increase in city waste production. The migrated population will meld themselves into the city’s itself developed sub-culture over a period of time and with the ever increasing advancements and increasing PPP (Purchasing Power Parity), the consumption is set to increase with an increase in total waste production. The next phase comes when the impact on environment of the city system is studied and worked on besides some social and economic impacts. In 1994, an official waste emergency was called in Campania Region of Italy by the President of its Council of Ministers. The reason behind such thing as quoted in some research paper was the failure of the regional plan which was introduced in 1993. The garbage problem in Naples, Italy's third-largest city stretches back to the 1980s, when the mafia began to infiltrate large waste-disposal operations. A number of events took place for the enhancement of the condition which includes the setting up of waste treatment plants, incinerators, involvement of private sector, etc. 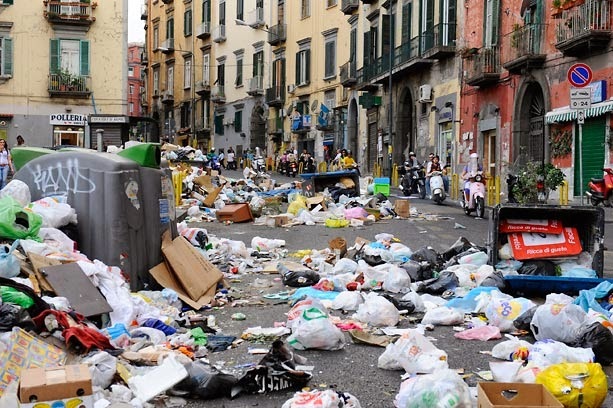 Beginning on December 21, 2007, the municipal workers refused to pick up any further material; as a result, the waste had begun to appear as regular fixtures on the streets of Naples, posing severe health risks to the metropolitan population. As per an estimate, over 200,000 tonnes of waste still remained on the streets in 2008. A contract was signed with the Dutch company AVR, which manages the Rotterdam incinerator, to transfer Naples garbage to the Netherlands at the rate of one ship-load per week. The initial operations have been allocated to the ship Nordstern, which started its transfer in 2012. As per an article published in Wall Street Journal in Nov 2013, a new garbage crisis is exploding on the outskirts of this city long plagued by recurring trash-handling problems—this time fuelling toxic bonfires that have burned unchecked and worries about contaminated water and food supplies. The lack of political will, overlapping of competences and confusion of roles, scarce monitoring and controlling, limited involvement of citizens in the political processes of waste management are some of the causes which led to the waste emergency in Naples. These are issues which could have sorted out if the administrators would have vision for both the short-term regulations and impacts in the longer run. This is just a case of Naples – this increasing waste production in the urban ecosystems is being experienced in various cities and it has to be dealt in more wisely with calculating the aspects on a wider picture and its impacts and effects – on the citizens quality of life, on the environment degradation, on the social factors involved and the economic factors – cities with such examples will be the least preferred cities for economic development and also for in habitation by the human population. The City as an entity has evolved into a very complex system and the complexity seem to be increasing every moment that passes by. The case of Naples discussed above could be seen as an alarm for various city developments and planning should likewise be done which includes the lessons and failure issues from the past examples and also the vision has to be divided into various disciplines and a wider frame for the city and its developmental aspects studied generally need to be outlined wisely. Waste management is regulated by a set hierarchy which stretches from a least favored option to a most favored option: disposal, energy recovery, recycling, reuse, minimization, and prevention represent the six procedures utilized. The waste production depends on every individual of a country. There are hundreds of things which an individual pass through everyday and if the individual is aware of the processes that these things precede its production and after its use – he may make the decision of consuming any article/thing smartly which will have a larger impact in the long run. It can be said that political/local authorities may not serve the purpose of providing a high quality life to its citizens alone. The community has to come in light. Alvin Toffler observes in “Anticipatory Democracy” ‘the political technology of the industrial age is no longer appropriate technology for the new civilization taking form around us. Our politics are obsolete’. Osborne stated – ‘therefore, the new direction should be to make public safety a community responsibility, transforming the police officer from an investigator and enforcer into a catalyst in a process of community self-help’. We could use the same waste for better useful purpose ! Article shows nothing but the truth. We have to be more aware and responsible for the problem surrounding our cities, villages and nature. Garbage disposal became one of the lead problems this century.